These horns are laser cut to maintain accuracy that wouldn't be possible other wise. 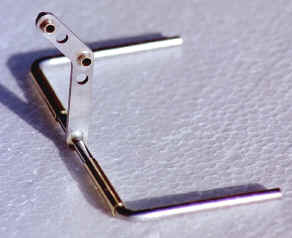 The upright material is 1/16 inch aircraft steel brazed to 1/8 inch music wire. The wire retainer bushings are brass. The pushrod bushings are 3/32 inch ID brass tubing brazed in place. The horn shown above is suitable for the Impact by Paul Walker and the Blue Max by Kaz Minato. Other designs could use this horn if the geometry works out. Click here for the CAD dimensions. The idea behind the shape of this horn is to keep the pushrod coming from the bellcrank and the pushrod going to the elevator horn at 90 degrees in relationship to the lever arm of this horn when the controls are in neutral, thereby giving equal deflection in both directions. The elevator horn has to be canted forward so that it is also at 90 degrees to the pushrod. A good example of this geometry is on Ted Fancher's Trivial Pursuit published in PAMPA magazine. Since the upright straight horns have served the stunt flier so well why go to these horns? Since the arrival of computer generated CAD programs designers have placed the geometry of our control systems under scrutiny. They have discovered that when the numbers are applied to conventional setups the deflection of the flaps and elevators are not equal in both directions . Is the difference noticeable when flying? It depends on the flier. Why stack tolerances when you don't have to. The alignment of these horns are just as important as a conventional horn. Attention to detail makes all the difference in the world. The other reason these horns were not widely available was the fact that they were costly to produce. This laser cut horn is patterned after the dimensions on Ted Fancher's Trivial Pursuit plans published in the PAMPA magazine. The horn looks a little different than the one on the plans because extra holes were added and the extra outside material is removed to save weight. The extra holes were added to give David Fitzgerald greater adjustability if needed. The holes were tapped 4-40 for Rocket City ball links. The upright arm is 1/16 inch aircraft steel, and the wire is 1/8 music wire. 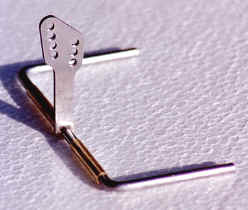 The horn can also be constructed with 3/32 music wire or 1/8 low carbon tweakable wire. 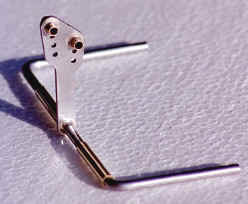 If you do not want the holes tapped for ball links, 3/32 inch ID brass tubing can be brazed in the holes of your choice. The top two holes on the horn are the ones the Trivial Pursuit plans specify. This horn would work on other aircraft as long as the geometry works out. This is an example of the horn above but with the exception of having the bushings brazed in place. Refer to the laser dimension page hyperlink on this page to see the dimensions of these horns. This adjustable elevator horn is laser cut with with a dog leg to provide clearance at the stabilizer trailing edge. By having a dog leg it is not necessary to notch the trailing edge of the stabilizer to provide clearance. The materials of this horn are the same as the other horns. The steel slider block slides in a 1/8 inch slot for adjusting the control ratio between the flaps and elevators and is held captive with a 4-40 socket head bolt. 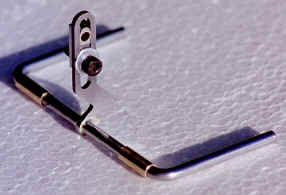 A bushing of 3/32 inch ID brass is installed in the slider block. The adjustment range is between 1 1/8 inch on the high side to approx. 3/4 inch on the low side. There is less adjustment on the high side since more than 1 to 1 ratio is rarely, if ever used. By adjusting more elevator throw into the setup you can increase the rate of turn. By shortening the moment arm of this horn you increase the amount of elevator deflection relative to the flaps. These horns are constructed with 3/32 or 1/8 inch music wire. Web site managed by Dan Winship. Copyright © 2002 Winship Models. All rights reserved.